Hutcherson L, Trawick BW. My NCBI  New Features for My Bibliography for eRA Commons Users. NLM Tech Bull. 2012 Jul-Aug;(387):e2. 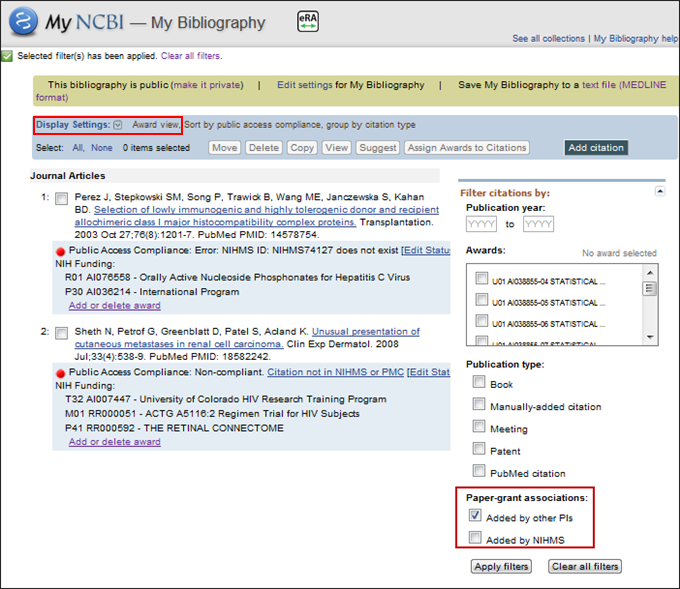 The My Bibliography Award View display, a tool developed by NCBI to assist eRA Commons users to comply with the NIH Public Access policy and associate their publications to NIH awards, will be enhanced in the following three ways: eRA Commons account holders will be able to associate any grant with citations in their My Bibliography collection, and they will be able to search for awards with the assistance of auto-complete; eRA users’ My Bibliography collection will be automatically updated to include citations that have been associated to the grants awarded to them; and new filter options will be added for paper-grant associations. Assign Awards is a My Bibliography Award View display feature that is used to associate or disassociate grants to citations and it is activated by clicking the link "Add award" or "Add or delete award" (see Figure 1). Figure 1: Add award link in citation. The new version of My Bibliography Assign Awards window consists of two tabs: Awards and Search/Add Other Awards (see Figure 2). The "My awards" section (see Figure 2, top section) provides the list of awards associated with your eRA Commons profile. The "Other awards" section displays those awards that are not associated with your eRA Commons profile, but have been linked to citations in your My Bibliography collection (see Figure 2), lower section). To add or delete award associations from either list to your citations, check or uncheck the checkbox next to an award and click the "Save" button. In some cases, it is not possible to deselect awards through the Assign Awards window (see Figure 2). For example, if a grant association was created in the NIH Manuscript Submission (NIHMS) system or if a grant was linked to one of your citations by the grant owner, in both cases the award checkboxes will be disabled. Contact the eRA Commons or NIHMS help desks for assistance in removing disabled award associations for your publications. Figure 2: Updated Assign Awards window. 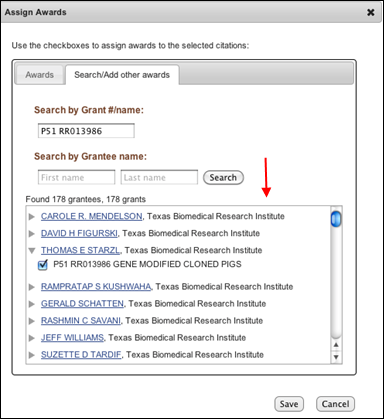 In the "Search/Add other awards" tab, you can search for awards using a grant number, award title or grantee name. 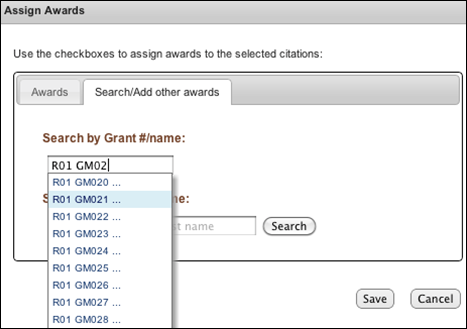 The search box includes an auto-complete feature (see Figure 3), which provides a list of possible grant number or name matches that are displayed as hyperlinks. Figure 3: Auto-complete in Assign Awards window. Select an award from the list provided and click the "Search" button. A list of grantee names affiliated with the award will be provided (see Figure 4). Check the award you wish to associate to a citation in your My Bibliography collection and click the "Save" button (see Figure 4). The award will be listed under the citation selected in My Bibliography, and it will be listed in the "Other Awards" section of the Award tab of the Assign Awards window readily available to be added to other citations. Figure 4: List of grantee names and their awards. My NCBI will notify award owners when citations have been associated to their awards and added to their My Bibliography collection. Once a citation is associated to a grant in My Bibliography or the association is made via the NIH Manuscript Submission system, the paper-grant association will be included in the PubMed record of that citation, and it will be linked to the grant in the NIH research activities database as well. My NCBI will automatically add citations to your My Bibliography collection based on new associations made to grants awarded to you. A message will be displayed (see Figure 5), which will provide you with a link to review the new citations added (see Figure 6). The alert message will remain until it is dismissed by clicking on the red X to the right (see Figure 5). 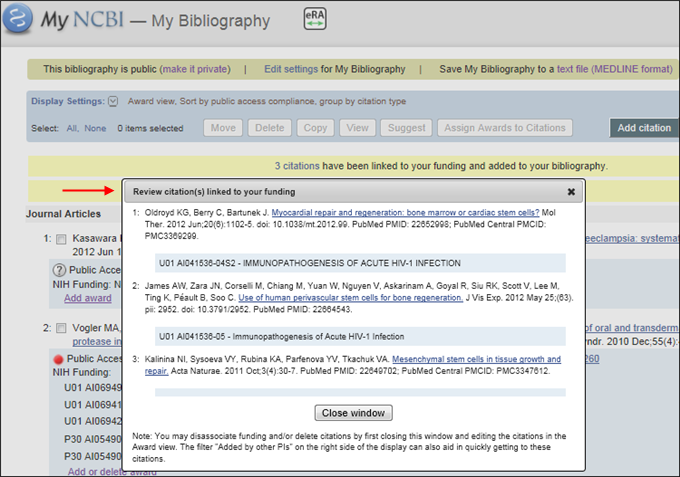 Figure 5: Alert message for new citations added based on funding information. Figure 6: List of citations added based on funding. If needed, the newly added citations can be deleted in the Award View display by selecting them and clicking the 'Delete' button. This action will also remove the associations made to your grants. The new filters added to My Bibliography Award View will facilitate viewing data more clearly by limiting citation results to those added through grant linking by other principal investigators (PIs) and the NIH Manuscript Submission system (see Figure 7). Select "Added by other PIs" to limit citation results to those added by other principal investigators. Select "Added by NIHMS" to limit citation results to those added by the NIH Manuscript Submission system. 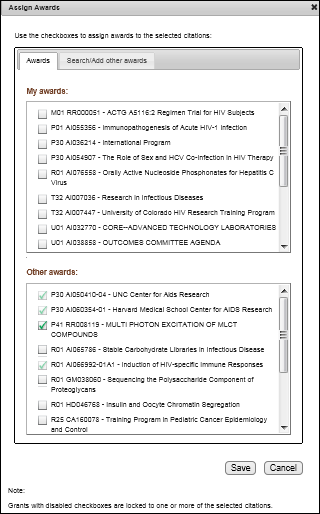 Figure 7: Paper-grant associations filters in the Award View display.